We are in the midst of the fashion gauntlet as the world’s designers present their Spring 2013 collections. I usually dissect them and share the key trends but this time round I thought I’d focus on one trend prediction – A Taste of the Orient. 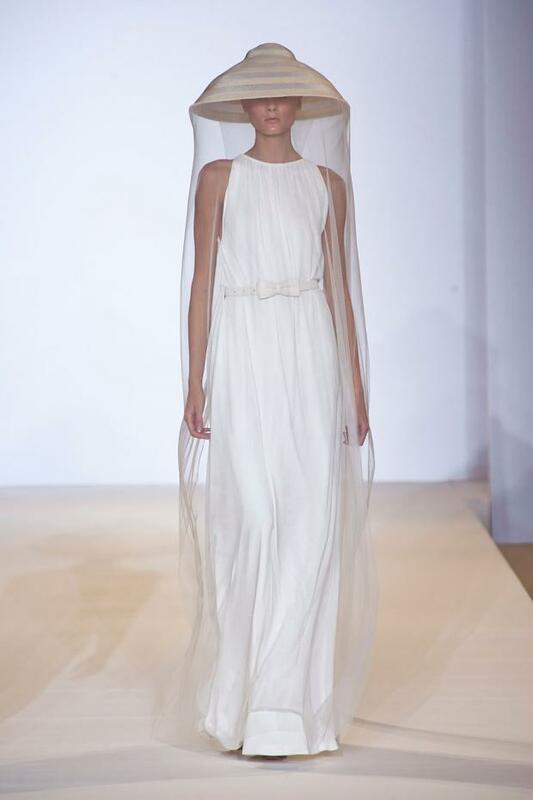 I wonder if Temperley London gave us a taste of Bridal things to come with Spring 2013 collection that saw model’s sporting rice field hats usually the reserve of Asian farmers. At Issa, dresses featured bright exotic flower prints and hair accessories to match. Marchesa were definitely having a Bollywood moment with a 2013 collection full of heavy embellishment, jewel tones and beautiful sari fabrics. I cannot wait to see their next Bridal collection! At Gucci the oriental influenced embellishment and flashes of bright red continued. All the more dramatic when teamed with bright white and slicked back hair. And when it comes to hair and make-up if you want to steal the Taste of the Orient look for your Wedding day, here’s how. Take a leaf from the models at Issa’s show use exotic flowers such as Singapore orchids to decorate your chosen hairstyle. Make Up should comprise of a bright red or fuchsia pink lip sat on top of dewy sunkissed skin.